Linus Adams, a key player for Kaduna United FC during the Nigeria Premier League 2010-2011, has recently signed for top club Enyimba FC from Aba. Adams is a 19 year old central defender who can also play as a defensive midfielder, a midfield anchor or a sweeper. MTN Football has described Adams as one of the most underrated players in Nigerian football, although he sometimes seems to make things more complicated than necessary. My first record of Adams is from August 2008 when he was starring for the Nigeria U-17 national football team. Adams first season at top level was for Kaduna United FC during the Nigeria Premier League 2008-2009. The talented youngster continued to represent Nigeria U-17 throughout the season. Adams started to play regularly for “the Crocodiles” during the Nigeria Premier League 2009-2010. Towards the end of the season, Adams was training with the Nigeria B national football team. The season 2010-2011 provided Adams with a breakthrough. His performances for Kaduna United FC in the Nigeria Premier League, as well as in the 2011 CAF Confederations Cup, made him a household name in Nigerian football and it was no surprise that he joined the more ambitious side Enyimba FC in December 2011. As far as I know, Adams has yet to score his first goal in the Nigeria Premier League. He did however score a goal against Foullah Edifice (Chad) on 20.03.2011 in the 2011 CAF Confederations Cup. Adams is also a good beach soccer player. In May 2011, Adams was part of the Nigeria national beach soccer team. Adams is born 06.12.1992 and could have a bright future in Nigerian football. However, expectations at Enyimba FC are high and history shows that several quality players from smaller clubs have failed to break through at “Peoples’ Elephant”. Personally, I believe Adams has what it takes. Linus Adams is one of many interesting new players at Enyimba FC. Others are midfielder Uche Agbo and striker Moshood Kasali from JUTH FC, right-back Cletus Promise James (born 14.12.1989) from Bukola Babes FC and playmaker Sani Aruwa (born 24.04.1987) from Kaduna United FC. The club is also in talks with JUTH FC with regards to their Ghanaian star striker James Amankwe. 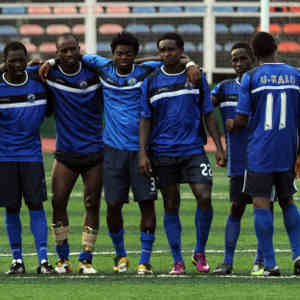 The picture of Enyimba-players is taken from SuperSport.